The Sony Ericsson line of smart phones have long had a loyal fan following. The P990i was announced about a year before market availability, but when it did go on sale at the end of 2006, interest was still high because its features were still not outdated. Though it pushed the right buttons among the tech-geek crowd for its features, users were soon disappointed to find that there were quite a few bugs in its built-in software. A quick Internet search will bring up criticisms of the UIQ 3.0 implementation not only on the P990i, but also on the M600i and W950i. While there have been firmware upgrades, users of those smart phones were recently up in arms because of talk suggesting that there would be no more development and bug fixes on UIQ 3.0. 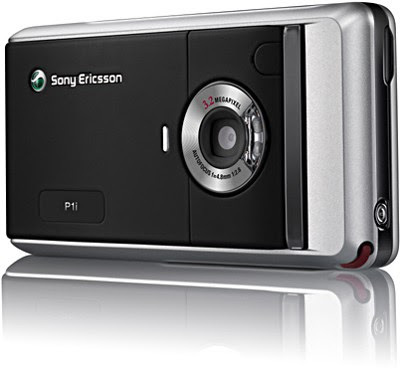 Shortly after, Sony Ericsson announced one more firmware release for the P990i and W950i devices in August, though none was promised for the M600i. Reviewed here is the latest P1i, one that moves away from the form factor of the previous P-series devices significantly. It uses UIQ 3.1, which will enjoy the bulk of development efforts from firmware and software developers. The mobile phones in the P series have always been somewhat bulky. The last few models had flip-out keyboards, the last two of which, the P910i and P990i, had both a QWERTY and numeric keyboard each. That added to the size significantly, not to mention that the main chassis of the P series smart phones have traditionally been quite thick. That has now changed with the P1i. Those familiar with Sony Ericsson's UIQ models will find that it looks more like the M600i than any P series device. This is thanks to its compact form factor as well as the exposed QWERTY/numeric keypad. Instead of a plasticky housing, the P1i has a matte metallic finish around the edges with a piano black gloss around the sides and front. The back, which is where the camera lens and battery cover are, has a different rubbery texture but is also in black. Compared with the M600i, the P1i has a much more solid feel to it. This is not just because of the material used but also due to its heavier weight. The reduced size and weight compared with the P990i will surely appeal to some who stayed away from that model because of the form factor. 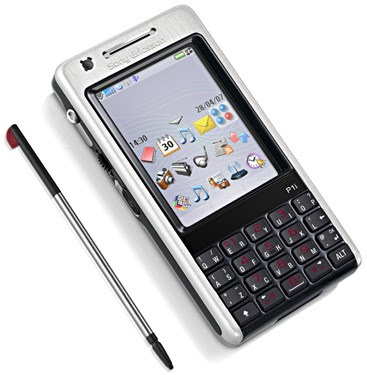 Sony Ericsson did not include a full QWERTY keyboard on the P1i, but instead put all the letters and numbers in 20 keys. Most of these keys rock left or right to serve as different letters. For example, the top left key is used for both the Q and W letters. Rocking it left will get you the former, while rocking right will type the latter. The center portion of the keypad has numbers in red laid out just like a regular numeric keypad for use in the phone application and when filling out fields where numbers should be entered. While such a keyboard layout saves space, it takes some getting used to. Essentially, typing a letter becomes a two-step decision. First, you decide which button to land your finger on, then which direction to rock the thumb toward. You could just land your thumb on the side you want and press it immediately, but that means there is very little room for error when it comes to the position of the thumb tip, a real challenge for those with large fingers. A scroll wheel is found on the left side of the device, meant for use with the left thumb. A back button below that makes it easy to get out of applications and menus. On the other side, there are shortcuts to the Web browser and camera application as well as a slot for the M2 memory expansion card. The single connector at the base of the P1i allows for charging and syncing, and lights up either green or red depending on the charging status of the battery, a helpful indicator to determine if it is time to disconnect after charging. 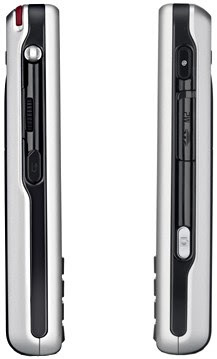 As we have come to expect from Sony Ericsson's smart phones, an anorexic stylus can be removed from the top left-hand corner of the handset. Connectivity options are plentiful on the P1i. For the cellular networks, it is a triband GSM phone and 3G-enabled. Other wireless options include wireless LAN and Bluetooth. Its Bluetooth implementation supports A2DP, which means you can connect a wireless stereo headset to it for music playback. While its wireless options should be sufficient for most users' needs, it is regrettable that they are exactly the same as the P990i's. We would have appreciated the addition of HSDPA for faster cellular data connections or a quadband GSM radio for better roaming options. The OS used on the P1i is Symbian 9.2 with the UIQ 3.1 interface. Symbian is the same OS used on many mid- to high-end Nokia phones, but the Series 60 interface used on those devices is very different from the touchscreen-supported UIQ on the Sony Ericsson smart phones. As with any OS, a user going in cold will need some adjustment time, but it is safe to say that the UIQ learning curve is not steep. Tapping the screen with the stylus is the best way to navigate the menus, naturally, but one-handed operation is not as convenient as other competing OSes. For example, moving between tabs in option screens requires either tapping the display or using the left and right arrow keys found on either side of the spacebar button. This is tedious because your left thumb, which can scroll up and down as well as depress the selector, must shift to either touch the screen or downward to the arrow keys to perform basic functions. It may seem nit-picky to point this out on a device meant to be used with a stylus, but the truth of the matter is that both Palm OS and Windows Mobile (5.0 onward) have made the direction pad efficient to the point where you can get to almost every field without touching the LCD panel. Being a business-orientated device, applications to open and edit documents are included with this handset. It also comes with a business card scanner program to be used in tandem with the camera for easy storage of contacts. Wireless syncing with your exchange server can be set up with a Dataviz application provided. As added convenience, a sync/charge cradle is also included with the P1i. A QVGA display capable of 262K colors is found on the P1i. Memory-wise, it has 160MB built-in not counting the 512MB M2 card included with the standard package. Buying more memory will be useful for those who wish to use it as a music player. The provided stereo headset does not allow you to connect your own headphones for lack of a 3.5mm audio mini-jack, and it isn't very comfortable, either. Fortunately, there are optional accessories from Sony Ericsson meant for that purpose. The FM radio feature worked excellently not only in radio reception, but also in ease of use when auto-searching and storing radio stations. The 3.2-megapixel camera found on the P1i has both an autofocus feature and LED light for dark situations. It produces good images for a mobile phone, and comes with options like macro and night mode for those specific situations. A second front-facing camera is found on the top left corner for video calls. One thing we did notice on the P1i was how responsive it is to screen taps and button presses. Even with multiple applications running in the background, we felt very little slowdown in the device. Memory management is done though the Task Manager, which can be accessed anytime by tapping the top right-hand corner of the display. A full charge of the 1,120mAh battery lasted us about 2.5 days. This included some Web browsing using both wireless LAN and 3G aside from normal phone use like calls and text messaging. Voice calls came through clearly, as was also the case with video calls when using the speakerphone. p1i with UIQ 3.2 and symbian 9.2 .... ?!?!?! ... what are they talking about ... p1i is UIQ 3.0 and symbian 9.1 !!! P1i is all i need to get me goin through my daily transaction...I'v been use it for a year plus & still serves great !! Just need a new casing though...! hopin for the next Business soon !